What do the detailed bounceback messages for bounced contacts mean? Then identify the bounce category in the list below, and refer to the details under Resolution. Explanation: The message bounced due to an invalid or non-existing domain, 5.X.X error. Resolution: Check the spelling and format of the domain, and edit the contact's details with the corrected domain. Once the contact has been updated, their bounce status will be reset and you can send to them again. Explanation: The message bounced due to a bad, invalid, or non-existent recipient address, 5.X.X error. Resolution: Check the spelling and format of the contact's email address, and edit with the corrected information. Once the contact has been updated, their bounce status will be reset and you can send to them again. Explanation: The message bounced due to an expired, inactive, or disabled recipient address, 5.X.X error. Resolution: Confirm with the contact if their email address is still active. Check the spelling and format of the contact's email address, and edit with the corrected information. Once the contact has been updated, their bounce status will be reset and you can send to them again. Explanation: The message bounced due to not being delivered before the two day window in which the system continues to attempt delivery, 4.X.X error. Resolution: Confirm with the contact if their email address is still valid, and edit the contact's email address with any updated information. If the email address has not changed, ask the contact to whitelist. Once that has been done, reset the contact's delivery status and you will be able to send to them again. Explanation: The message bounced due to receiving no response from the recipient's server after connecting, 4.X.X or 5.X.X error. Resolution: The recipient's mail server is offline or has an issue in its configuration. Ask the recipient to investigate if there is an issue with their mail server. Once that has been done, reset the contact's delivery status and you will be able to send to them again. Explanation: The message bounced due to other reasons, 4.X.X or 5.X.X error. Resolution: The system did not receive any detailed message back from the recipient's mail server. Ask the contact to whitelist. Once that has been done, reset the contact's delivery status and you will be able to send to them again. Explanation: The message bounced due to a policy reason on a recipient address or domain, 5.X.X error. Resolution: This is usually due to a message being classified as spam by a recipient's mail server or due to some type of limit restriction in place on the recipient's side. Ask the contact to whitelist. Once that has been done, reset the contact's delivery status and you will be able to send to them again. Explanation: The message bounced due to the recipient's mailbox being over its limit, 4.X.X or 5.X.X error. Resolution: Confirm with the contact if they are able to receive email. Once that issue has been resolved on their side, reset the contact's delivery status and you will be able to send to them again. 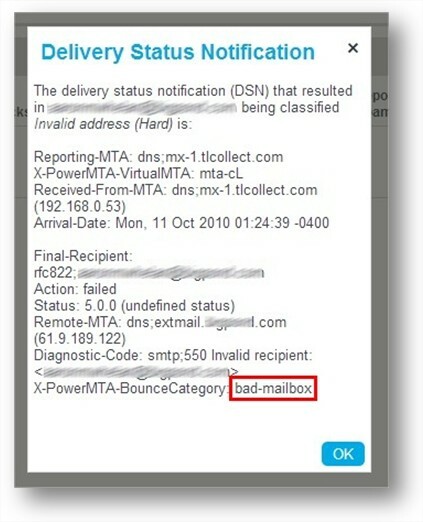 Explanation: The message bounced due to mail routing issues for a recipient domain, 5.X.X error. Resolution: This is usually due to an invalid configuration in the DNS records on the recipient's mail server. Ask the recipient to investigate if there is an issue with their mail server. Once that has been done, reset the contact's delivery status and you will be able to send to them again. Note: Sometimes you may receive a rooting loop error, this means that the recipients email has an automatic reply as well as the sender email. When both addresses have an automatic reply the email gets stuck between them causing a loop. To rectify this, either send at a later date or ask the contact directly if they've received the email as it can still go through. Explanation: The message bounced due to spam related reasons, 5.X.X error. Resolution: This is usually due to a message being classified as spam by a recipient's mail server. Ask the contact to whitelist. Once that has been done, reset the contact's delivery status and you will be able to send to them again. However if the bounceback shows a code (e.g #5.1.1 shown below), please refer to the SMTP code article for explanations of these bouncebacks. To further analyze issues with certain bounce categories (bad-domain, no-answer-from-host, and routing-errors), you can also find additional information about the issue using an MX Lookup tool. Type the recipient's domain (e.g. abcompany.com) into the Domain Name box, and click the MX Lookup button. If the result is "No records found", the recipient's domain does not have its MX records configured properly in its DNS. That will need to be resolved before the recipient can receive any external email at that domain. If a record is listed with the hostname and IP address, that means an MX record was found. 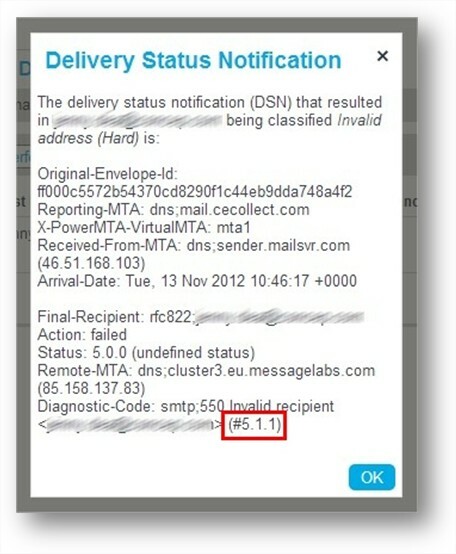 Click the "SMTP Test" link to see the test results when contacting the recipient's mail server. If the results listed all include green bullets before them, you will be able to send to the recipient without any issues once you have reset their delivery status, as whatever issues were causing the message to bounce previously have now been resolved. If the results listed include red or yellow bullets before them, you can provide that information to the recipient to aid in their investigation of their mail server configuration.